Public perceptions about pot have come a long way, from the dire warnings of "Reefer Madness" to growing acceptance of medical marijuana to the legalization of recreational weed use. On July 27, the New York Times published "High Time: An Editorial Series on Marijuana Legalization," which called for the federal government to repeal its ban on marijuana. Matt Figi's 7-year-old daughter Charlotte was once severely ill. 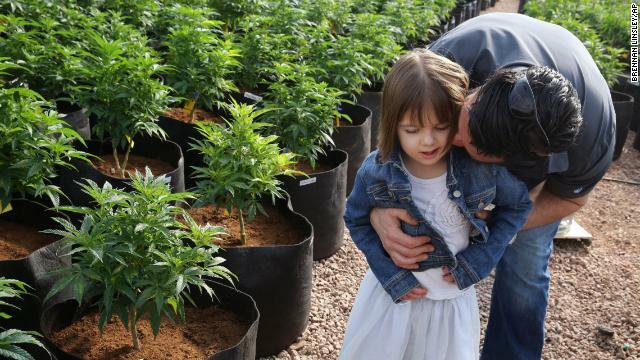 But a special strain of medical marijuana known as Charlotte's Web, which was named after the girl early in her treatment, has significantly reduced her seizures. On July 28, Rep. Scott Perry, R-Pennsylvania, introduced a three-page bill that would amend the Controlled Substances Act -- the federal law that criminalizes marijuana -- to exempt plants like Charlotte's Web that have an extremely low percentage of THC, the chemical that makes users high. 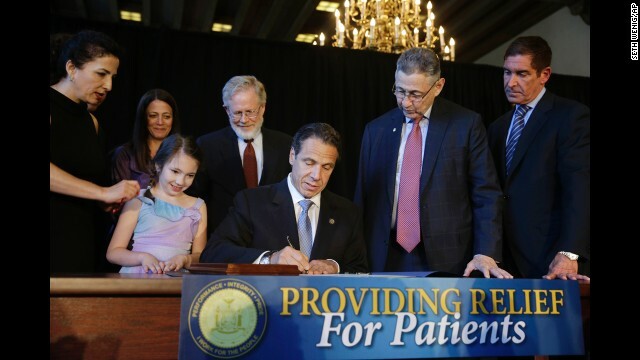 While politicians and supporters look on, New York Governor Andrew Cuomo signs a ceremonial bill to establish a medical marijuana program in New York, on July 7, 2014. New York is the 23rd U.S. state to authorize medical marijuana. February showed 54% of Americans support legalization of marijuana. 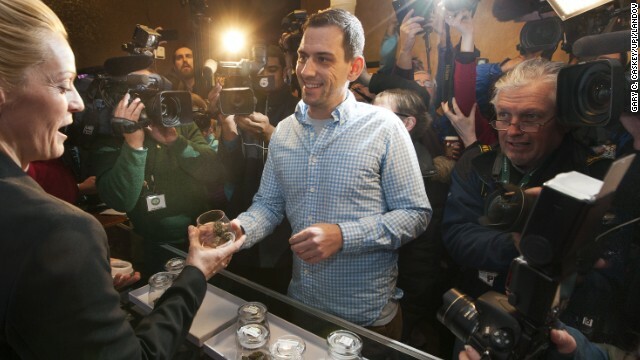 Sean Azzariti, an Iraq war veteran and marijuana activist, becomes the first person to legally purchase recreational marijuana in Colorado on January 1. 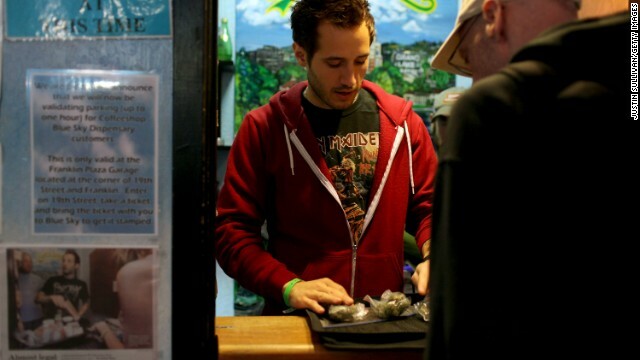 Colorado was the first state in the nation to allow retail pot shops. "It's huge," Azzariti said. "It hasn't even sunk in how big this is yet." 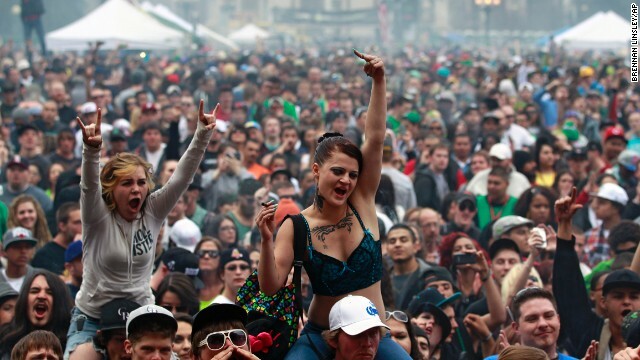 Members of a crowd numbering tens of thousands smoke and listen to live music at the Denver 420 Rally on April 20. Annual festivals celebrating marijuana are held around the world on April 20, a counterculture holiday. 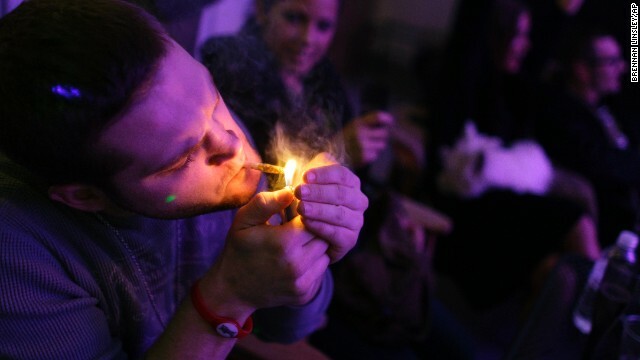 A man smokes a joint during the official opening night of Club 64, a marijuana social club in Denver, on New Year's Eve 2012. 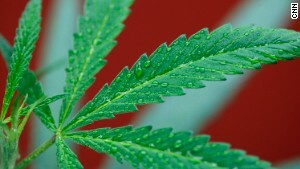 Voters in Colorado and Washington state passed referendums to legalize recreational marijuana on November 6, 2012. 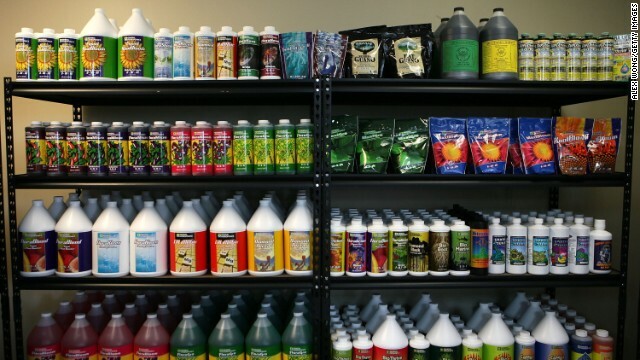 Nutrient products are placed on shelves in the weGrow marijuana cultivation supply store during its grand opening on March 30, 2012, in Washington, D.C. The store is a one-stop-shop for supplies and training to grow plants indoors, except for the actual marijuana plants or seeds. 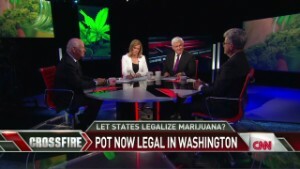 Legislation was enacted in 2010 authorizing the establishment of regulated medical marijuana dispensaries in the nation's capital. 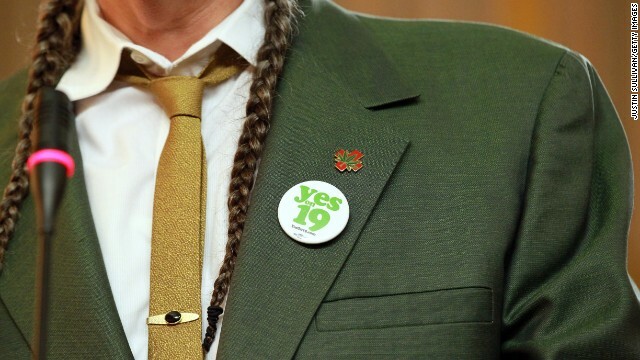 Marijuana activist Steve DeAngelo wears a "Yes on Prop 19" button as he speaks during a news conference in Oakland, California, on October 12, 2010, to bring attention to the state measure to legalize marijuana for recreational purposes in California. Voters rejected the proposal. People in New York gather for a pro-cannabis rally on May 4, 2002. 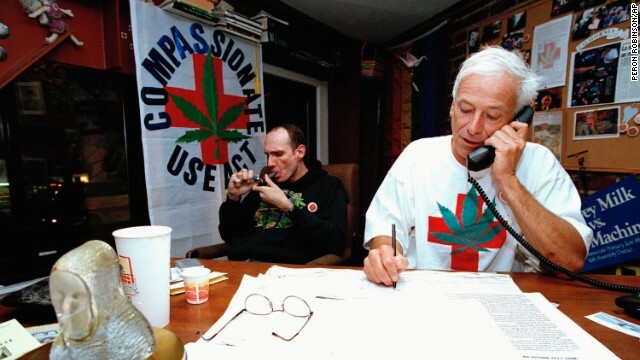 That same day, almost 200 similar events took place around the world to advocate for marijuana legalization. 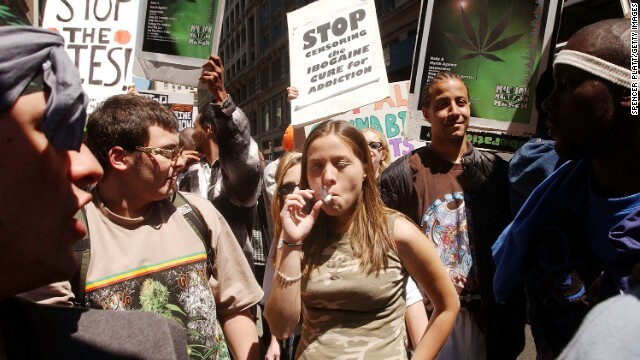 It was dubbed the "Million Marijuana March." 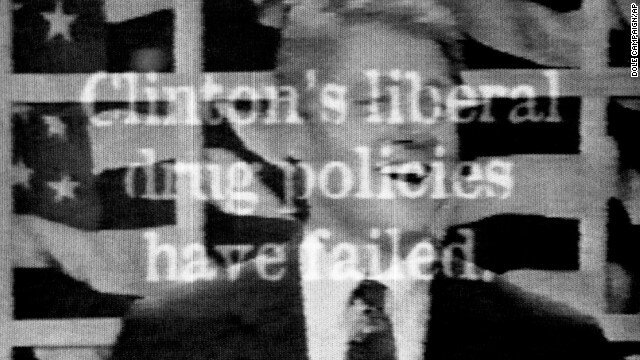 A television ad aired in 1996 by Republican presidential candidate Bob Dole's campaign included footage from a 1992 MTV interview of a laughing President Clinton saying he would inhale marijuana if given the chance to relive his college days. 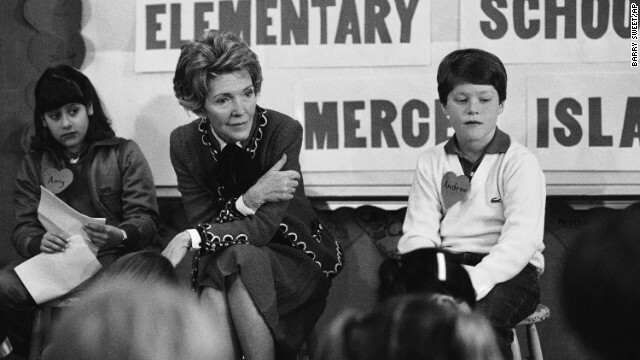 First lady Nancy Reagan participates in a drug education class at Island Park Elementary School on Mercer Island, Washington, on February 14, 1984. 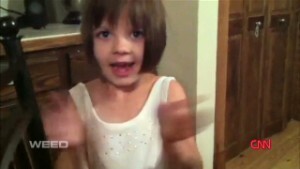 She later recalled, "A little girl raised her hand and said, 'Mrs. 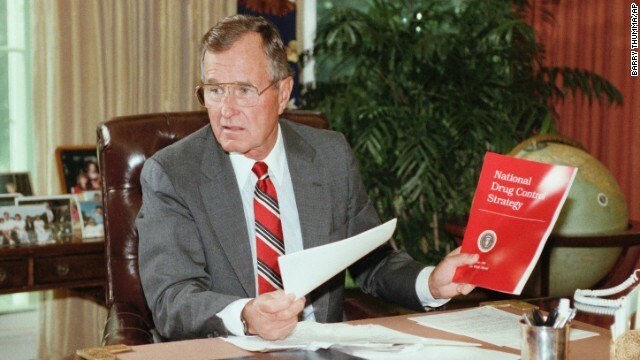 Reagan, what do you do if somebody offers you drugs?' And I said, 'Well, you just say no.' And there it was born." She became known for her involvement in the "Just Say No" campaign. 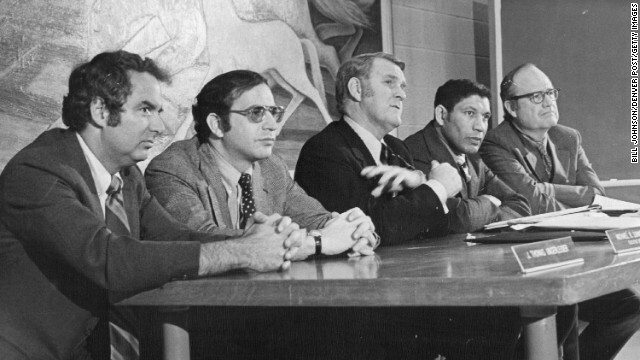 Panel members of the National Commission on Marijuana and Drug Abuse attend a hearing In Denver on January 10, 1972. From left, Dr. J. Thomas Ungerleider, psychiatrist; Michael R. Sonnenreich, commission executive director; Raymond P. Shafer, commission chairman; Mitchell Ware, Chicago attorney; Charles O. Galvin, Dallas law school dean. 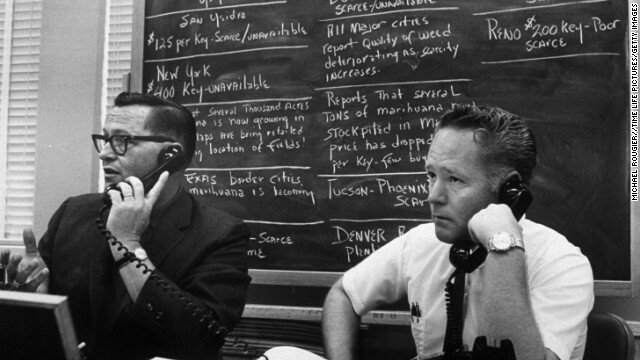 The commission's findings favored ending marijuana prohibition and adopting other methods to discourage use, but the Nixon administration refused to implement its recommendations. 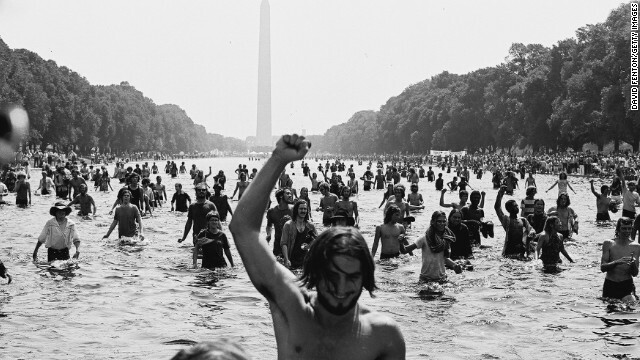 Protesters wade in the Reflecting Pool at the National Mall in Washington during the "Honor America Day Smoke-In" thrown by marijuana activists in response to the official "Honor America Day" rally organized by President Nixon supporters at the Lincoln Memorial on July 4, 1970. 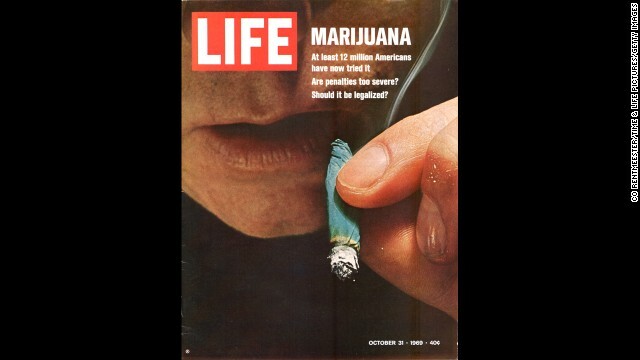 Marijuana reform was the Life magazine cover story in October 1969. The banner read: "At least 12 million Americans have now tried it. Are penalties too severe? Should it be legalized?" 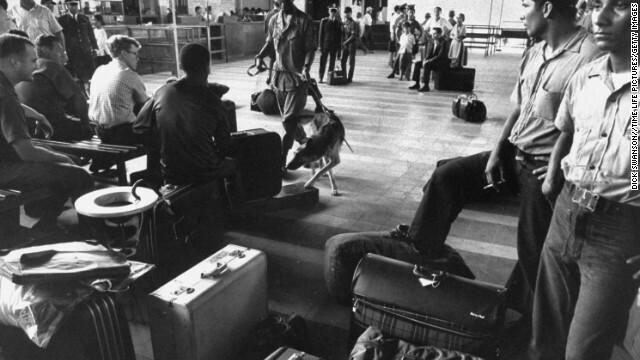 Police dogs trained to smell out hidden marijuana examine U.S. soldiers' luggage at the airport during the Vietnam War in 1969. 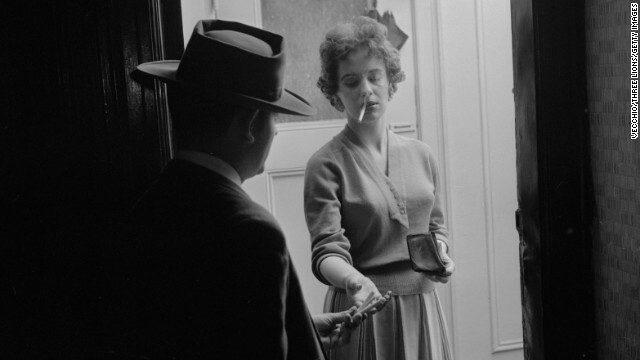 Drug use was widespread during the war. 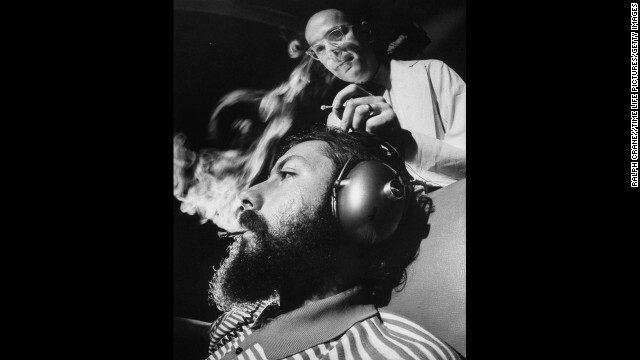 Research scientist Dr. Reese T. Jones, right, adjusts the electrodes monitoring a volunteer's brain response to sound during an experiment in 1969 that used a controlled dosage of marijuana. The tests were conducted at the Langley Porter Institute at the University of California, San Francisco. Even after Congress cracked down on marijuana in 1937, farmers were encouraged to grow the crop for rope, sails and parachutes during World War II. 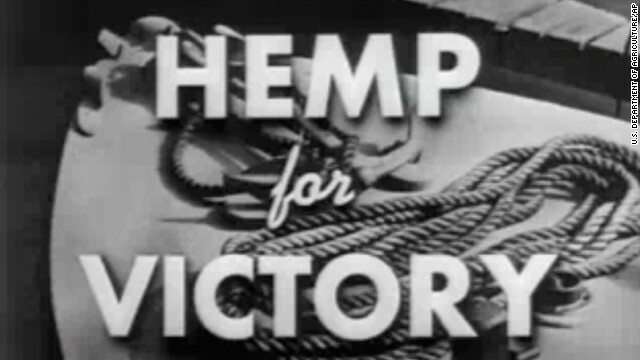 The "Hemp for Victory" film was released in 1942 by the U.S. Department of Agriculture. 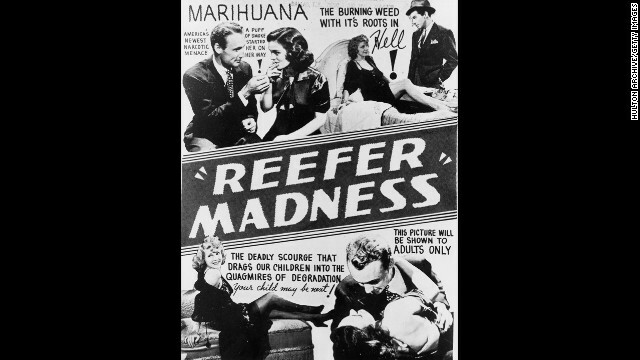 A poster advertises the 1936 scare film "Reefer Madness," which described marijuana as a "violent narcotic" that first renders "sudden, violent, uncontrollable laughter" on its users before "dangerous hallucinations" and then "acts of shocking violence ... ending often in incurable insanity." 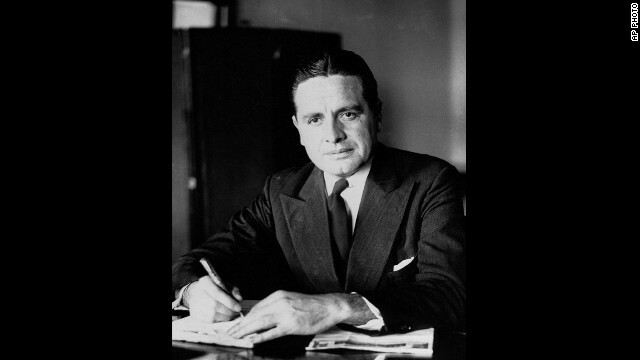 Harry Anslinger was named commissioner of the Federal Bureau of Narcotics when it was established in 1930. 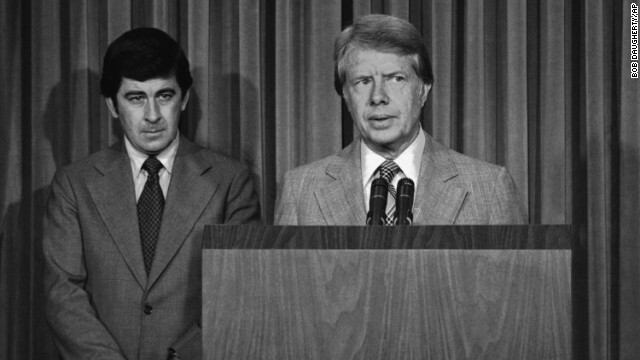 While arguing for marijuana prohibition, he played on Americans' fear of crime and foreigners. He spun tales of people driven to insanity or murder after ingesting the drug and spoke of the 2 to 3 tons of grass being produced in Mexico. "This, the Mexicans make into cigarettes, which they sell at two for 25 cents, mostly to white high school students," Anslinger told Congress. Editor's note: Julian Zelizer is a political historian at Princeton University and a New America Foundation fellow. He is the author of the forthcoming book, "The Fierce Urgency of Now: Lyndon Johnson, Congress and the Battle for the Great Society." The opinions expressed in this commentary are solely those of the author. 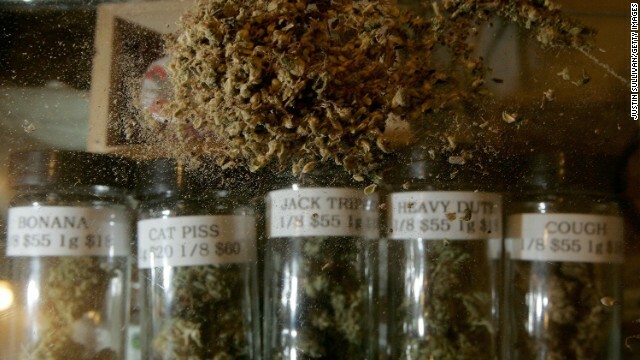 (CNN) -- A few decades ago, marijuana was a topic that relatively few people, mostly counterculture musicians and comedians, spoke about in public. The comedy team of Cheech and Chong made films such as "Up in Smoke" that extolled the pleasures of smoking pot at a time the subject was still taboo. 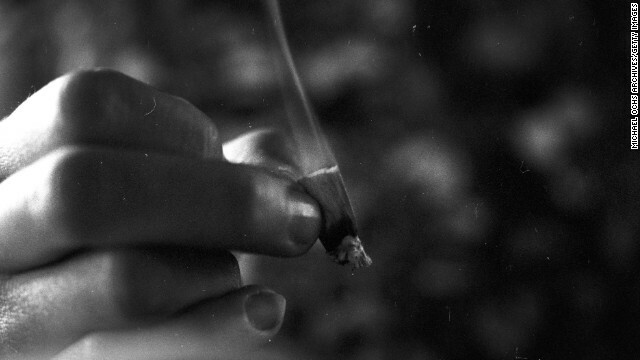 "When trouble times begin to bother me," they sang, "I take a toke and all my cares go up in smoke." On the fringes of American society, it was usually possible to find activists who wanted to legalize it, as the reggae artist Peter Tosh famously sang. 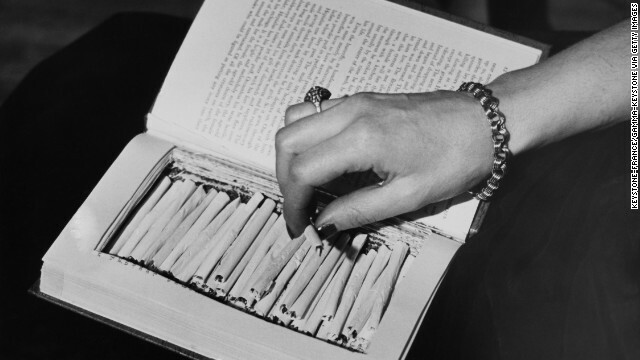 Efforts to legalize the substance in the mid-1970s failed. Now marijuana has gone mainstream. Twenty three states and the District of Columbia have legalized medical marijuana. Colorado and Washington have legalized pot for recreational use. 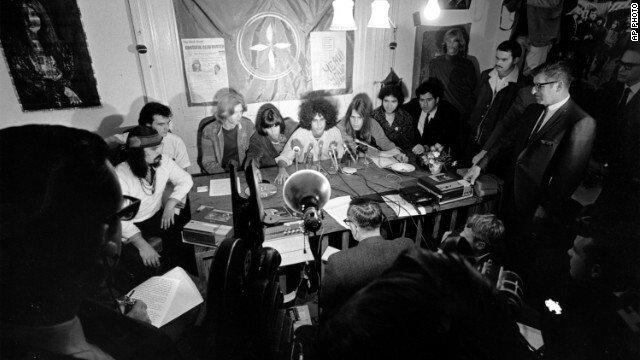 The media has featured lively debate over the issue. 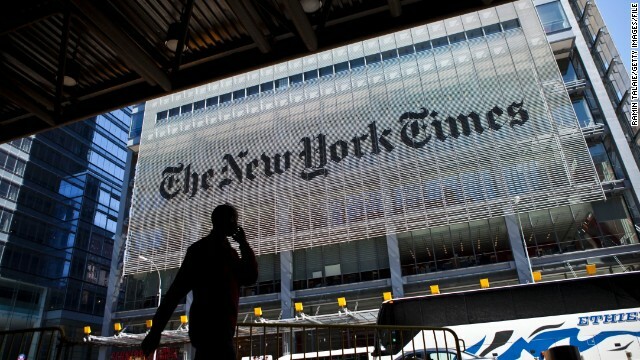 Joining other media outlets that have run articles supporting this cause, The New York Times editorial page published a number of high-profile pieces that call for making pot legal at the national level and outline specific steps that should be taken to ensure that the industry evolves in a safe manner. How did we reach this point? How have we come to the brink of ending the national prohibition against a drug that has been roundly condemned for years as a grave danger to health and a gateway to drugs that can be devastating over time? 1. Generational change: The baby boomers are now the grandparents in the room. This is one of the most important factors driving the national debate. 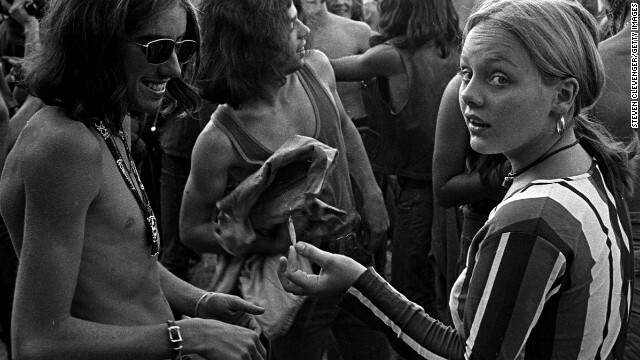 Baby boomers grew up in an era when the use of pot was quite common. 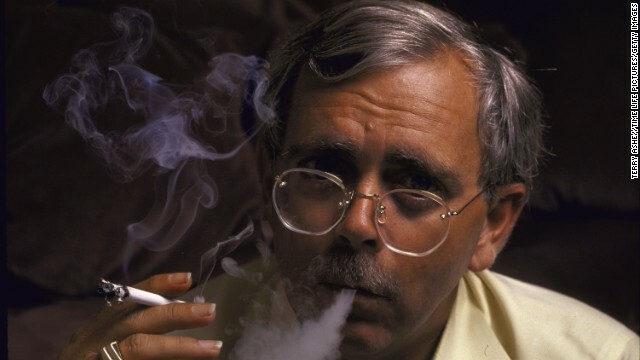 Even if a person from this generation did not smoke themselves, they knew someone -- often friends or family -- who did. 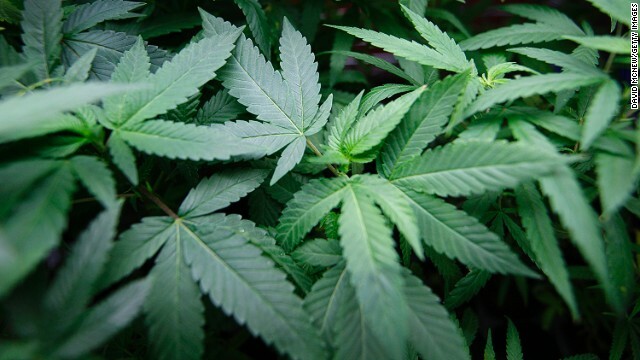 According to a Pew Poll released in April, 52% of baby boomers favor legalization. Martin Lee who directs the medical marijuana information service, Project CBD, said, "It's not just long-haired rebels and stoners. It's Mom and Dad, Republicans and Democrats, a real slice of America." Their parents, who were more staunchly opposed to allowing this drug to be used, are now extremely elderly or deceased. With a gray generation that is more comfortable with the drug being used and sees it as not being greatly different than alcohol, the tenor of the debate changes. Younger and middle aged Americans don't find much pushback. With 69% of millennials supporting legalization, according to the same Pew poll, the opposition to legalization keeps falling. 2. The War on Drugs has failed: Many experts agree that the War on Drugs, launched under President Richard Nixon, has been a complete failure. Often compared to the Prohibition Era, when Congress tried to ban alcohol, it has been clear that the focus on the legality of the sale and use of drugs -- rather than on the provision of services to addicts -- has resulted in bloated prisons and hugely expensive policing operations, neither of which have really stemmed the sale of these substances. Indeed, the fact that drugs such as marijuana have been illegal has spurred an unregulated criminal market that preys on disadvantaged Americans who often depend on this as a source of money. While the danger of drugs such as heroin produces genuine confusion as to what the best alternative is, with lesser drugs such as marijuana, the best option seems clear: eliminate the laws. Opponents of legalizing pot are in the position of defending a failed approach to public policy. 3. The prison-industrial complex: The failure of the War on Drugs has been part of the reason that we have seen in the explosive growth of the prison-industrial complex that incarcerates millions of Americans, including a disproportionate number of African-American inmates. 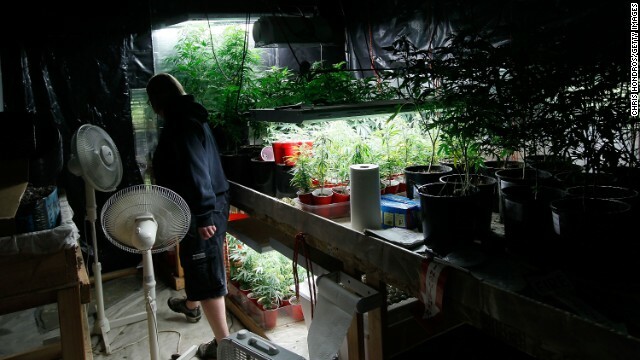 Much of the push to legalize pot has come from the realization that imprisoning Americans for selling pot, with overflowing federal prisons that become training grounds for young men and women for a life of crime, is a bad idea. 4. States as laboratories of experimentation: With great frustration over national drug policy, the states took the lead. This has often been the case when areas of policy are broken and the federal government is too gridlocked to do anything about it. Over the past decade, numerous states have legalized the use of marijuana for medical purposes and most recently, in Colorado and Washington, for recreational purposes. Each time a state government takes this step, it gives the cause more legitimacy. Each time more citizens live with legal marijuana and and life goes on without the change causing any great crises. The states offer models to other states, and perhaps the federal government, as to how to legalize pot. 5. Medical research: Thus far, there is no medical evidence that the drug has horrendous effects if used in moderation and, just as important, it has been shown to be much safer both in its effects and aftereffects than legal substances such as alcohol. Moreover, there is growing evidence that the drug can be used to help with ailments such as glaucoma, MS, severe migraines and other kinds of diseases. To be sure, the verdict is still out and research must continue. But at this point there is not sufficient evidence to justify the ban. 6. Market incentives: As with almost everything else in the United States, markets can have a powerful impact on public opinion. The fact is that the legal marijuana market can mean big business for producers and sellers of the product in the United States. One expert predicted that the marijuana business, estimated at $1.5 billion in 2013, could reach $10 billion by 2018. The New York Times reports that startups have been taking advantage of the opportunities in this growing industry where major corporations have not taken charge. With so many areas of the economy reeling from the "new normal", in which the industries that created jobs simply don't return, the revenue potential from selling pot is attractive. 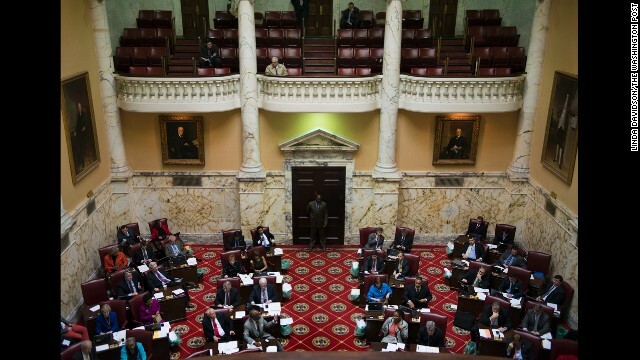 Many state politicians are also looking to the substance, realizing that taxing it could bring in much needed revenue, just as the alcohol tax was a boon for the government after the repeal of Prohibition. 7. Pop culture: When it comes to social change, popular culture matters. Many commentators have noticed the impact that the increasingly widespread depiction of homosexual characters in movies and television had on social attitudes. The same is true with pot. Of course, drug use has a longer place in popular culture. Musicians from the 1960s were already extolling the drug long before it was mainstream. One just has to listen to Simon and Garfunkel's famous concert in Central Park, where they thank the drug dealers, to find this history. But pot use has also become more familiar in mainstream movies (such as the hit television show "Weeds" and films by Judd Apatow) without great stigma. Television shows such as "Mad Men," "The Office," and "Shameless" have featured characters smoking pot without it being a focus of the show. 8. Opinion makers: With all the pieces in place, the opinion makers have jumped in as well. More and more editors, journalists and reporters are talking about pot as if it is something that can and should be be legalized. The probability that the national prohibition on marijuana will end is becoming greater every day. It is almost inconceivable to imagine that it will last much more than a few years. This has been a long process, one where many factors have converged to transform the way that we think of a law and a substance. The important next step will to give as much attention to the way we handle legal markets once they are in place.